From Fortune, based on data from the 2010 Census: DC has more single-occupant households than any other major US city. 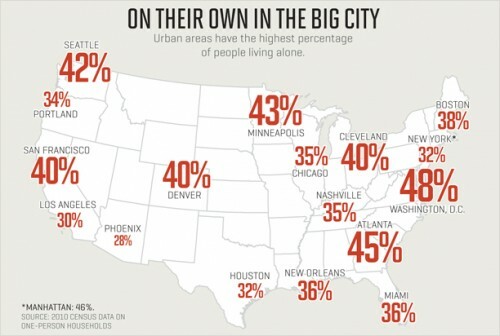 DC’s 48% of households is even higher than Manhattan’s 46%. Fedward Potz moved into the District in 1999 with a four year plan and never left. He enjoys good food, craft cocktails, photography, music, and long walks on the beach. Seriously? Where are all of these people living in one bedrooms and studios? Almost every single person I know has at least one roommate. For that matter, where are all of these one bedrooms and studios that apparently represent so much of the housing market? I think the important detail here is that the number counts households, not people. Single adults living with roommates could contribute to the percentage of single-occupant households by reducing the total number of households being counted. The more roommates you have, the less your household factors into the count.